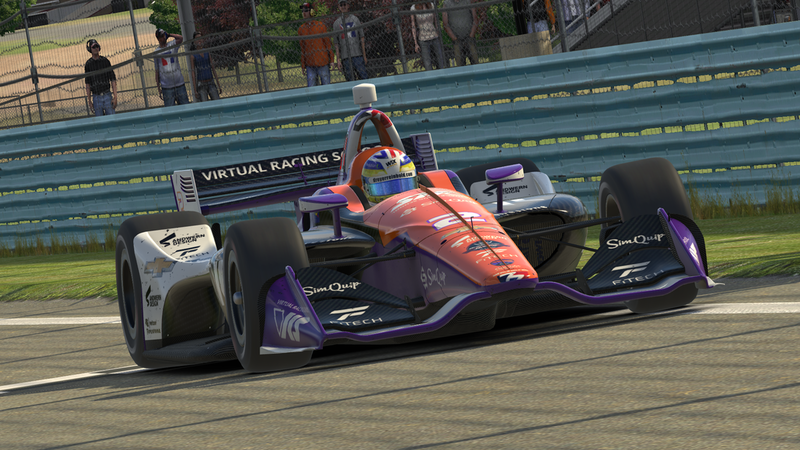 It’s been 28 days since Sage Karam put on a dominating display at the SimXperience Grand Prix at the Glen. While the movie of the same name was a horror film, the 28 days the rest of the field had to practice their road course game was sorely needed as Karam dominated the Glen race. Ryan Otis, one of the strongest road drivers in Lionheart finished the 37 lap event 24 seconds back. George Sandman, a rookie with a large amount of road racing experience finished 36 seconds back. Overall only 10 cars finished on the lead lap. The Lionheart Retro field is hoping that the horror of the Glen will give rise to a new day at Round 3, the Plasma-Tracks Grand Prix of Sebring. Based on last round’s display, it would be difficult to look at contenders beyond Karam, however 2 that can’t be overlooked are Alex Saunders and Ryan Otis. Word in the paddock is that Saunders has another commitment that may keep him from racing. He made an uncharacteristic mistake at the Glen, so if he can make the race look for it to be a very motivated Alex Saunders. Otis meanwhile had a solid display and ran with Karam for a little while. Where the Glen was smooth and flowing, Sebring will be tight and bumpy. Will this play into Otis’ hand? Three rookies to look out for on Thursday night are J.P. Windschitl, Richie Hearn, and Lionel Calisto. Windschitl has been fast in practice, while Richie Hearn was fast at Watkins Glen before running into some issues and retiring. Calisto, meanwhile, was able to recover from his mistake, albeit 3 laps down due to a tow. Despite this fact, he was setting lap times that would have put him in the top 10. If these 3 can make it through the full event, look for them to be at or near the front. Speaking of making it through events, so far only 2 drivers not named Sage Karam have managed to finish in the top 10 in both races so far. Dustin Wardlow and Chris Lanini are both names readers and viewers of the Lionheart series should recognize. Both well understand the value of finishing a race above all else, and find themselves 3rd and 8th respectively in the points because of this. As some of the rookies learn this lesson the hard way, Wardlow and Lanini are already off to excellent starts to the season. In the team standings, Raven Motorsports Black is off to very strong start to the season thank to the efforts of Otis, Wardlow and James Paulson, who are 2nd, 3rd and 6th in the main championship with 2 races down. Already 74 points back is NLR Sim Racing, while Raven Motorports Silver is a further 28 points back. From there down, however, things get crowded, as 3rd through 16th are separated by less the 100 points. All it will take is a couple bad races for the Raven Black team, and this could easily turn into any teams championship. This Lionheart Retro Series season is just a couple rounds old, and already plenty of intrigue is developing. So far the veterans are dominating, but with so many rookies in the field, that won’t last forever. Sebring will be a tough test for rookies and veteran alike, as this is the first time the Retro series has raced on the track. The long bumpy airport runways and the tight twisty road sections will both test these L79 drivers in equal measure. Who will be triumphant at the end? Will it be Karam, Otis or Saunders? Or will it be a rookie, staking his claim on the Retro Series. 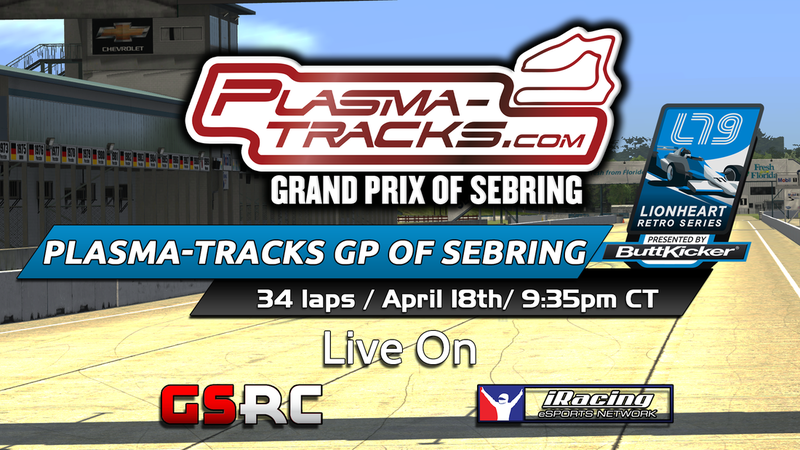 Tune in Thursday April 18th at 10:35pm eastern to find out, only on the iRacing eSports Network presented by GSRC. All around America, short tracks around the country rumble every Wednesday throughout the summer with the sound of race car engines. From midgets to late models to modifieds nothing is better then spending the night at your local short track. Now it’s time for the Lionheart boys to get in on the action. It’s short track racing Lionheart style from ISM raceway for the Thumbs Up, Cancer Down Phoenix 200! Last week at Kentucky, we had a first a first-time winner with Scotty Johnson taking his first ever Lionheart Victory. Johnson had stayed out as the caution came out at the tail end of the final pit cycle when Connor Harrington turned Jason Galvin down the back straight. The two had been running at the front for most of the race and would have cycled back to the front, however Harrington misjudged it as he tried to dive under Glavin, and turned the California driver into the wall. Ken Hacker also had his best ever Lionheart finish with his 2nd place effort, while reigning champ Adam Blocker turned a 41st qualifying position into a 3rd place result, showing the form that made him a champion last year. Dan Geren led the most laps, but only managed 4th after the late caution forced him to use his tires up just to get through the field to the leaders. Tony Showen rounded out the top 5. In contrast to the high banks of Kentucky, the D shaped oval at ISM presents the next challenge Lionheart drivers will have with a short track. Last year it was Brian Yaczik tasting his first Lionheart victory at ISM. With 2 first time winners in 3 races already in 2019. The odds are in favour of another new winner happening a second time in 2 years at ISM. Bryan Carey is so far the cream of the rookie crop. The Canadian has demonstrated that he can run consistently on ovals and is a threat on road courses. With 200 tricky laps at an oval where lifting will be a factor, maybe Carey will be able to apply his road course speed to his oval consistency and take the checkered flags at the end. Or maybe it will be Michael Goodman. Goodman has been one of the most consistent drivers in Lionheart history, constantly knocking on the door of wins with top 5’s and top 10’s galore on his resume. Goodman has qualified at the front in all 3 races this season, however his last 2 have ended in heartbreak not of his own creation. Perhaps a short track race at Phoenix, a track similar to the Rock, where he took his all-star race win, will finally net him his first points paying Lionheart win. But then there are the veterans who are looking to get wins of their own. Brian Yaczik is always dangerous and will be looking to defend his win. Andrew Kinsella has been up front at almost every short track in the past 2 seasons, however is another driver with a string of bad luck. Maybe this will be the day he breaks through and gets his first win of 2019. Jason Galvin is always fast and aggressive, and will be looking for revenge for his late race heartbreak at Kentucky. James Krahula and Joe Branch are to consistent drivers who are known for fuel strategies of opposite ends. Krahula will pit early and often, while Branch will extend his tank past where most other drivers will. Both strategies can work depending on when the yellow flags fall, and it wouldn’t be a surprise to see one of them near the front at the end if the yellows fall their way. The final element all the drivers will have to contend with is the setup. After last years race saw a distinct inability to pass the leader in clean air, the Lionheart race engineer has taken away a substantial amount of downforce from the drivers, force the drivers to lift at both ends of the race track, even in clean air. This has been done in the hopes that the aero-push that prevent passes for the lead last year will be a thing of the past, however it also has resulted in many drivers needing to adapt their driving style to extract the most out of the set-up. It would not be surprising to see a few unknown names at the front of the field. 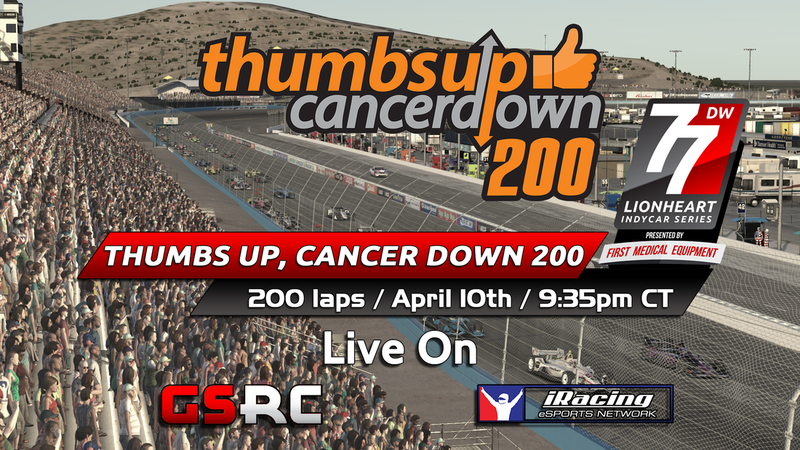 For all of the action from the Thumbs Up, Cancer Down Phoenix 200, tune in on Wednesday April 10th at 10:35pm eastern on the iRacing eSports Broadcasting Network presented by the incomparable folks at GSRC! Sometimes it pays off to be lucky and good. Scott Johnson was both Wednesday night, and it paid off in the biggest of ways, with his first career win in the Lionheart IndyCar Series presented by First Medical Equipment.The Minnesota native led the final 22 laps after a caution propelled him into the lead, holding off Ken Hacker and a hard-charging Adam Blocker for the surprise win. Johnson had yet to stop during green-flag pit cycles late in the race. Already planning on stretching his fuel as far as he could, Johnson was one of five drivers still on the track when Connor Harrington spun Jason Galvin on lap 114 – in what was a battle for the lead amongst driver who had already pit – causing Galvin’s car to careen off the wall on the back straight before being plowed by Bob Mikes. Both Galvin and Mikes were unable to continue, and Harrington was assessed a drive through penalty by race control for reckless driving. He would finish 24th, two laps down, after running in the top three for most of the event. Justin Weaver beat Johnson off pit road, but was issued a penalty for going through the stop sign at pit exit. Johnson inherited the lead, and never looked back. Ken Hacker was able to fend off a hard-charging Adam Blocker for second. The result was the best of Hacker’s career. Blocker rallied from the 41st starting position to earn his third podium in as many races in 2019. Dan Geren led a race-high 71 laps from the pole, but had to settle for fourth after the late caution. Tony Showen, who was in the mix along with Geren, Galvin and Harrington for the win, came home fifth. The race was slowed four times by cautions totalling 15 laps. Three of the wrecks occurred before anyone could really find a rhythm. On lap 15, Adrenalin Motorsports teammates Bryan Carey and Chris Stofer tangled exiting turn two. Carey made a passing move and did not realize Stofer was below him, sending his teammate crashing into the inside wall. Chaos ensued on lap 26. Contact sent Michael Goodman into a slide where he tagged Andrew Kinsella. Kinsella spun across the track, and several other cars were collected. Ron Hacker received the worst of it, barrel rolling down the back straight. On lap 35, Jason Robarge, Joe Flanagan and Sage Karam became collected in calamity corner, turn tow. All three would retire. The race would run green, with Geren, Harrington, Galvin and Showen pulling away over the next two fuel stints until the Galvin crash and final restart. Blocker holds a 13 point lead over Geren through three of the 24 scheduled events in the 2019 Lionheart IndyCar Series presented by First Medical Equipment. Dustin Wardlow jumped up one spot to third in points, with Weaver and Brian Yaczik tied for fourth. It’s a quick turnaround for the teams, who head to a short track for the first time in 2019. The Thumbs Up, Cancer Down Phoenix 200 at ISM Raceway is scheduled for Wednesday, April 10 and can be seen live on the iRacing eSports Network with coverage by Global SimRacing Channel. ​If Wednesday night was any indication, Sage Karam will be tough to beat. The real-world IndyCar star showed his might in the sim world as well Wednesday night, leading 33 laps en route to winning the Minus 273 Grand Prix at The Glen presented by Cranfield Simulation. 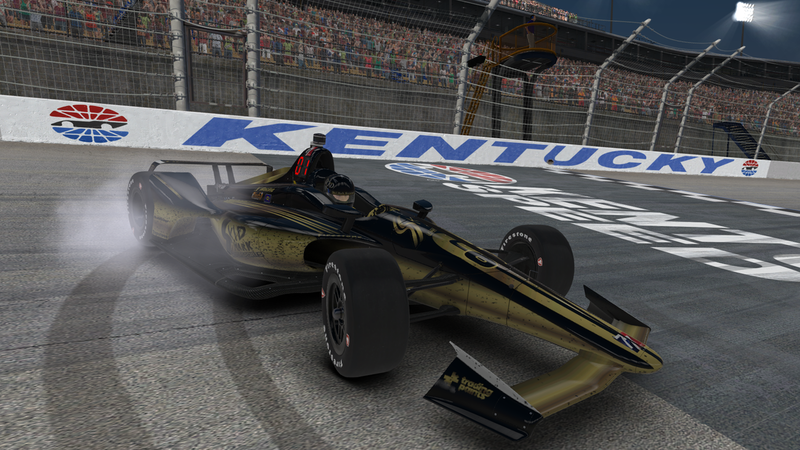 Karam led all but four laps, beating defending champion Adam Blocker by 16 seconds, while capturing his first win of the season in the Lionheart IndyCar Series presented by First Medical Equipment. Karam rebounded from a tough opening race at Homestead, where a multi-car crash put his virtual IndyCar behind the wall. Wednesday night, Karam made sure nobody could get in his way. Blocker led four laps during pit cycles, but was never really close to Karam. Connor Harrington ran a clean race, moving up from fifth to earn the final podium spot. Andrew Kinsella and Bryan Carey rounded out the top five – the teammates both started outside the top ten – as part of a mad dash to the finish in the back half of the top ten. Dustin Wardlow, Justin Weaver, George Sandman, Stephen Laarkamp and Tyler Graaf rounded out the top ten. The gap from fourth to 10th was less than three seconds. 26 of the 40 starters finished the race. Incidents ended the night for several competitive drivers. Brian Yaczik spun entering the pits while running in the top ten, and hit the wall, ending his race. Third place starter Damon Martinez and fourth place qualifier Michael Goodman both wrecked before lap three. Bob Mikes, Chris Stofer, Isaiah Dupree and Chris Lanini were all out before the third lap as well. It’s early, but the top of the points look similar to how 2018 ended. Blocker leads Dan Geren by 13 points, with Kinsella one point back in fourth. Wardlow and Harrington round out the top five. The Lionheart IndyCar Series presented by First Medical Equipment heads back to the ovals, first at Kentucky Speedway for Oma’s Kentucky 200, a race dedicated to the memory of league member Marc Aumick’s mother-in-law. Shari Boggs, known as Oma to her grandkids, lost her battle with cancer in 2017. 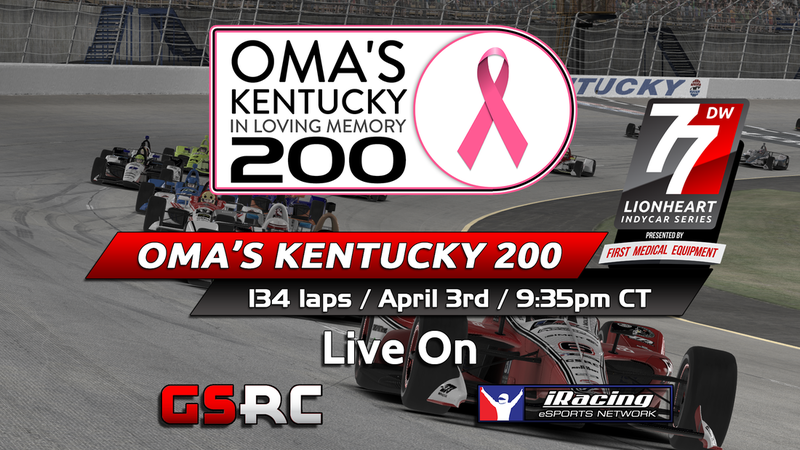 The race can be seen live on the iRacing eSports Network with production by Global SimRacing Channel Wednesday, April 3, at 10:40 p.m. EST. The more things change, the more they stay the same. 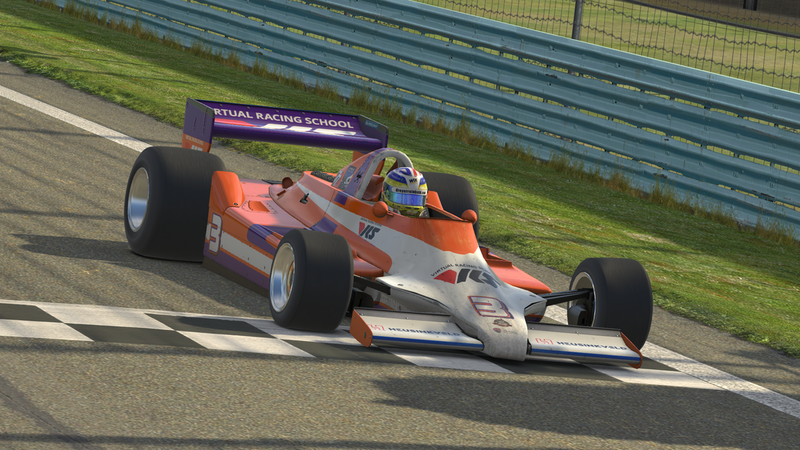 Pole winner Sage Karam dominated the SimXperience Grand Prix at the Glen Thursday night, capturing his first win of the season in the Lionheart Retro Series presented by ButtKicker. Despite the race featuring 29 rookies vying for their first wins, the event featured a nearly identical script to the first two Retro events at the Glen. In 2017, Ryan Otis led every lap from pole position. Last season, Alex Saunders completed the same feat. Karam made sure history would repeat itself. Otis finished a distant second, 24 seconds back of Karam. But he did lead the race, even if just for 300 feet on the first lap. Rookie George Sandman held off veteran Dustin Wardlow by three seconds to claim the final podium spot. Chad Dalton completed the top five. Ten drivers finished on the lead lap, with 25 of the 34 starters finishing the event. Saunders – the series runner-up in 2018 – took a big hit to his championship hopes so early on. After winning the season opener at Homestead-Miami Speedway, the Nighthawk Motorsports driver retired on lap 31. While running in second, and with Otis breathing down his rear wing, Saunders got up on the curb exiting turn one. The car bottomed out over the curb, causing it to twitch and then spin hard into the wall, and forcing the defending event winner to retire. Karam jumps to the points lead, 21 ahead of Otis. Dustin Wardlow sits third, with Jorge Anzaldo and Saunders completing the top five. The Lionheart Retro Series presented by ButtKicker takes a long break before round three, the Plasma-Tracks Grand Prix of Sebring. You can catch that race live on the iRacing eSports Network with presentation from Global SimRacing Channel at 10:35 p.m. EST. Sharon ‘Shari’ Boggs Hackettstown resident, dedicated educator and volunteer with a wide range of interests, ‘a giving and generous person’ Sharon “Shari” Boggs of Hackettstown, NJ, beloved grandmother, mother, partner, sister, friend, educator, and volunteer, died in her home on Wednesday June 28, 2017, after a long, brave battle with cancer. She was 75 years old. Shari is survived by her three grandchildren, Aidan, Clara, and Lilly; daughter, Kim; son Greg; partner Bob; brother Steve; sister Vicki; and all those she had touched or helped over the years. Born on Nov. 23, 1941 in Louisville, KY, Shari lived for 48 years in Hackettstown, NJ. She was an educator for most of her adult life, always seeking ways to improve upon her students learning experiences and her ability to teach them. Shari shared her love of teaching and helping others throughout her life, and was honored this year with induction to the Hackettstown Medical Center Foundation “Senior Hall of Fame” for her significant volunteer work and accomplishments throughout Warren County, NJ. Here are some of the efforts for which Shari was known: volunteer head of the Hackettstown, NJ, Pajama Program, a national organization that provides pajamas and books to children in need. Since 2010, Shari was a driving force in collecting pajamas and books for local children. Over the years, she helped collect over 1600 pairs of pajamas and nearly 1300 books. She was also a longtime volunteer leader of “Bookworms,” the adult book club of the Northeast Branch of the Warren County Library; a volunteer instructor in the English as a Second Language (ESL) program through Trinity United Methodist Church, and had involvement as a volunteer in First Book (FirstBook.org), a national organization that provides “equal access to quality education for children in need” Shari was instrumental in collecting numerous contributions for children in Warren County. Additionally, she was a volunteer at the Norwescap Head Start Program in Phillipsburg, NJ, where she spent many hours reading to children, and a volunteer at the Lord’s Pantry at Trinity United Methodist Church, helping to provide food to those in need in the community. In addition to her family, friends, and volunteer work, Shari loved to exercise. Among other activities, she liked canoeing and kayaking on the Delaware River, hiking on the Appalachian Trail, and practicing yoga. While her all-time favorite activity may have been playing tennis, she was most often recognized as “that lady who’s always walking along Main Street in Hackettstown”! It was on these walks that Shari connected with new friends, and it was then that she may have been happiest, especially when she could be accompanied by family or an old friend or two. Shari graduated with a bachelor of science in education from Wittenberg University (Springfield, OH) in 1963, and received her master of education from East Stroudsburg State College (East Stroudsburg, PA) in 1982. Shari was a giving and generous person, and so she had pre-arranged for her body to be donated to Rutgers’ Robert Wood Johnson Medical School for advancement in medical science. The family would like to acknowledge the efforts of Thomas Jefferson University Hospital Doctors Takami Sato and Carin Gonsalvez, who were tenacious in their efforts to give Shari the quality of life she enjoyed for nearly four years. Sharon (Shari) Boggs lived in Warren County for 48 years. Her earliest volunteer work was with the Bucket Brigade to raise money to build what is now Hackettstown Medical Center. Because of her teaching background, she went on to volunteer with several organizations that helped those in the community with communication skills. The first of these was instructor in English as a Second Language program through Trinity United Methodist Church. Because of her experience in the ESL program, Shari recognized the need for reading materials in the home. Thus, she became involved in the national organization First Book (FirstBook.org). This program provides “equal access to quality education for children in need”. All of the contributions that Shari was instrumental in collecting for First Book are disseminated to children in Warren County. Fulfilling her acknowledgement of the importance of reading brought her to the Norwescap Head Start Program in Phillipsburg, where she spent many hours reading to children. Her compassionate and loving nature sent her on a quest to find another organization to help children in Warren County. The Pajama Program, a national organization that provides pajamas to children in need, was the perfect fit for Shari. For 8 years Shari had been the driving force, with the assistance of Trinity United Methodist Church, in collecting pajamas and books for our local children. In all of those years, she had been able to collect over 1600 pairs of pajamas and almost 1300 books. Shari’s great love of books is not limited children. She has been the leader of “Bookworms”, the adult book club of the Northeast Branch of the Warren County Library for many years. Our nominee has also volunteered at the Lord’s Pantry at Trinity United Methodist Church helping to provide food to those in need in the community. While giving of herself to all of these organizations, Shari battled cancer. She participated in the American Cancer Society Relay for Life helping to raise funds for research. Despite her struggle, Shari never wavered in her desire to help others. So Shari “old lady” this race is for you. Thanks OMA for the memories and life lessons you have taught us. We love and miss you. – Kim, Marc, Greg, Bob, Aidan, Clara and Lilly. New season, new drivers, same results. Dan Geren, picked up right where he left off at Auto Club; in victory lane for the First Medical Equipment 200 at Homestead. Despite a long off season with new drivers arriving in the series such as George Sandman and Sage Karam, last year’s top 4 in points, namely Geren, Adam Blocker, Andrew Kinsella and Michael Goodman, occupied 4 of the top 5 positions at the end of Round 1, with the 5th belong to Chris Stofer, last year’s Turning Point award winner for best 2nd half in comparison to their first. Needless to say, all of these drivers are very familiar to Lionheart viewers. But the oval drivers in Lionheart have long been considered the best oval IndyCar drivers in iRacing, and it was bound to take the rookies a few races to get up to speed. But for now the series shifts to the road course at Watkins Glen for the Minus 273 Grand Prix at the Glen. This is where the rookies might start to show their teeth. Sage Karam has been dominating the Retro road races this year, comfortably clearing Ryan Otis and Alex Saunders in the L79 last week. The big question, though, will be if that translates over to the IndyCar. With more horsepower then grip, the L79 rewards the brave, which Karam has demonstrated he is, however the IndyCar has a completely different style all together. Will Sage be able to adapt quickly to the demands of the modern car after practicing so much for the old style of racing last week? George Sandman had a quiet Lionheart debut to 16th at Homestead, being a rookie not only to Lionheart but to oval racing in general. Sandman has had far more experience over the years on the road courses, and has shown himself to be fast in practice leading up to the race. Another driver who is more experienced on the road then on ovals is Adrenaline’s rookie Bryan Carey. Carey has also shown that Watkins Glen could just be his breakout party for Lionheart. But these 3 rookies will have to go through a host of veterans if they are going to win. Adam Blocker dominated the road courses in 2018, winning 7 of 8 to demonstrate himself to be the fastest road driver in Lionheart. He is not going to go down without a fight. Dan Geren was Blocker’s constant foil, always shadowing the Carolina driver, but never quite managing to come out on top. Dustin Wardlow managed to win the race at the Motegi Road Circuit, Andrew Kinsella took 4 podiums en-route to finishing in the top 5 at all 8 road course rounds in 2018. Justin Weaver and Stephen Laarkamp spent a good portion of each road race battling each other for top 5’s, and Michael Goodman and Brian Yaczik were constant top 5 threats. If you are looking for a dark horse candidate, however, the names Tyler Graaf and Marc Cohn might be the best places to look. Cohn, although he is a rookie, won the winter Challenge series Lionheart puts on, and demonstrated he could be a force on the road this season. Graaf meanwhile has put in the most testing miles so far of any driver in the series, and so far the results are paying off on the practice timesheets. The key for Graaf will be eliminating the mistakes that cost him so many times in 2018. Then there is the track. The high-speed winding road course will present some series challenges for all drivers, rookies and veterans alike. The off-camber corners waiting to spin out the driver who gets to greedy with the gas, while the curbs in the bus stop are ever-present, waiting to bite the driver who gets a little to brave. 42 drivers will go in, but how many will remain unscathed? 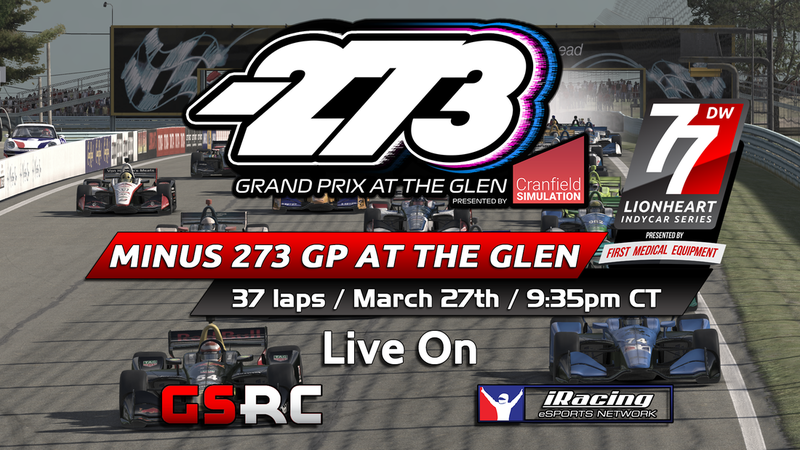 Tune in to watch the drivers of Lionheart Indycar Series present by First Medical Equipment do battle at the Minus 273 Grand Prix at the Glen, Wednesday March 27th, 2019 at 10:35pm EDT only on the iRacing eSports Network presented by GSRC.